*NOTE: This is a general price list only. Call anytime for services not listed, or for quantity pricing. CHARITABLE/NON-PROFIT ORGANIZATIONS ELIGIBLE FOR 10% DISCOUNT ON ALL SERVICES. *Minimum 4-hr. call applies. Tape/media stock extra. Multi-camera shooting also available; call for pricing. 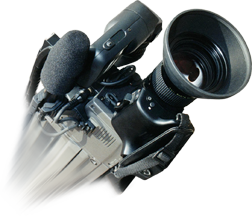 Video/Audio Editing (DV/HDV-Stereo/Quad Channel) $30.00/hr. DV/HDV-MPEG2/4 Compression (for Web) $5.00/hr. *Additional $15.00 setup charge applies. Tape/disc stock extra. Logo Animation (to 5 objects) $300.00/sec. Special Effects (per object) $200.00/sec. Digital Image Conversion- Bitmap to Vector $30.00/hr. Custom Artwork- Print/HDV Resolution $300.00/ea. Custom Artwork- SD Video Resolution $200.00/ea. Custom Label Design- CD/DVD/Blu-ray® Disc $75.00/Lbl. *Additional $5.00 setup charge applies. Paper stock extra.